Today, we turn to the UK in a guest post by Laura Tarver. a London-based Speech and Language Therapist working with children with ASD and other complex needs. She previously worked in a primary school for children with ASD, where PODD and Aided Language Displays were introduced as part of a school wide approach in order to enhance the communication-friendly environment for all pupils. In this post, she shares how they used PODD books and aided language input to build the students’ communication skills. PODD (or Pragmatic Organisation Dynamic Display) communication books were developed in Australia by Gayle Porter, originally for children with cerebral palsy. As their use becomes more widespread throughout the world, practitioners are considering the benefits of using them with other clinical populations. Their structured organisation and emphasis on visual communication means that they are also a valuable tool for developing the communication of those with Autistic Spectrum Disorder (ASD) (Porter & Cafiero, 2009). Teaching communication skills to children with ASD has traditionally focused on a limited range of basic functions such as requesting. However in recent years, research has shown that if practitioners assume children are capable of more, and provide input to match these assumptions, then the results often exceed the expectations of everyone working with them (Mirenda, 2008). The PODD communication system is taught through a focus on natural language stimulation, where visual language is modelled alongside verbal. The adult language partner points to the symbols representing the key words of her sentence while speaking. The children therefore see picture symbols used for an entire range of functions by capable communication partners, and in doing so learn how to use this communication method within natural settings. This way of communicating echoes how typically developing children learn language. The consistent use of picture information alongside verbal also plays to the visual strengths of ASD learners, and helps with their understanding of instructions, information and questions as well as showing them a means of expressing themselves (Cafiero 2004). All these strategies are used alongside existing communication techniques, such as Makaton and PECS, according to each child’s needs and preferences. Introduction to the use of PODD communication books can begin with the use of single sheets of topic specific vocabulary, known as Aided Language Displays, or Activity Displays. Within an educational setting, these sheets can be used consistently alongside activities such as ‘playdough’, ‘snack’ or ‘phonics.’ These sheets are made up using a symbol set, typically Boardmaker, to meet the vocabulary requirements of the activity in each particular setting. You can download my examples here. Vocabulary is organised from left to right to loosely imitate sentence structure in written and spoken English, although certain key symbols such as ‘more’ and ‘finished’, which frequently appear on displays, are located in the same place each time to help the learner’s understanding and use of them. Displays can be stored with the resources for each activity, to encourage staff members to bring the displays out and use them each time the activity takes place, or can be placed on the wall next to static activities such as ‘trampoline,’ ‘toilet’ or ‘sandpit.’ The Speech and Language Therapy team provide staff with advice and modelling on how to use the displays in a natural way, to accompany their spoken language. It is important that children are not forced to use, or even to look at the displays, but that any attempt to use the symbols in a communicative manner was responded to in a positive way. 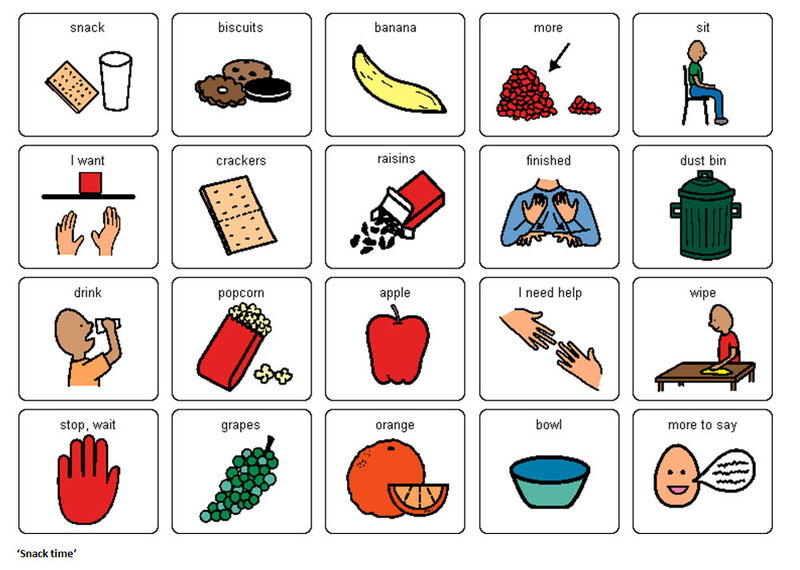 While Activity Displays form an excellent introduction to aided language, by their very nature they limit the vocabulary, and therefore the messages, which can be conveyed to and by the AAC user. PODD communication books aim to have a vocabulary wide enough to meet the learner’s needs. As this naturally changes as the child’s proficiency with AAC grows, different formats of PODD book are available, ranging from nine symbols per page, up to containing several hundred symbols overall. Books are also personalised with vocabulary or topics important to the user. As with Activity Displays, children learn to use it through aided language stimulation, through constant modelling of how to use the book in natural situations, rather through any discrete teaching. It is therefore crucial that the child’s communication book is used throughout the day in all situations, both to ensure that modelling is frequent enough for the child to learn its meaning, and so that communication is modeled in a wide range of scenarios and for a mix of different functions. The name ‘Pragmatic Organisation Dynamic Display’ refers to the fact that there is a structured way of navigating between pages throughout the book, through a series of ‘go to page (number) instructions and through operational commands such as ‘turn the page’ and ‘go back.’ Each page contains vocabulary predictably associated with that topic (e.g., including pronouns, verbs, nouns and descriptors), rather than the traditional method of organising vocabulary purely according to category. This reduces the number of page turns which are needed, and therefore increases the speed and efficiency of communication. In addition, PODD books contain ‘pragmatic branch starters’ such as ‘I’m telling you something’ ‘Let’s pretend’ or ‘I’m asking a question,’ which allows the AAC user to show the communicative function of their message, something which is often expressed through context, gesture or intonation by a verbal speaker. (e.g., pathway 4). You can download the sample pathways here. The biggest challenge when introducing PODD books into classrooms within the school was ‘creating the habit’ among adults in the school. This included the necessity of a child having their PODD book with them at all times, and for staff to use Aided Language to support all of their messages, both when teaching and when talking informally to a child. As pupils became more familiar with, and dependent on their PODD books being their ‘voice,’ this difficulty lessened, as many children took responsibility for their own books (and often became upset if they were forgotten!) and staff saw the benefits of their efforts. Training on how to use the books was run for both staff and parents. To lessen the enormity of using a whole book, new users were recommended to focus on familiarising themselves with a different pathway each week, and to focus initially on using on the book consistently to communicate a handful of messages, rather than trying to navigate to the vocabulary for every single thing they wanted to say. 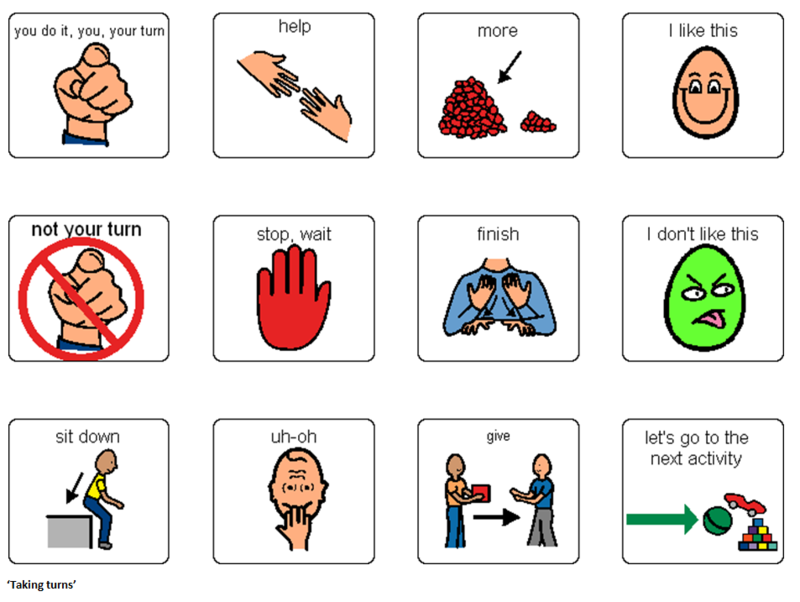 A year after Aided Language Displays and PODD books were introduced, wide-ranging benefits were seen to the children beyond just supporting their expressive communication. Staff and parents fed back that their use had far-reaching effects on pupils’ behaviour, engagement within classes and understanding of information. One parent reported that ‘I’ve definitely noticed an improvement in his speech [talking] and I didn’t think I’d see that. He’s calmer now, not so frustrated and when he uses the book, when he points to the pictures to tell you, he smiles, ‘cos he knows he’s told you. I don’t have to say ‘I don’t know what you’re saying;’ that made him angry. He doesn’t get so anxious now, definitely.’ Staff also became more aware of pupils’ capabilities, as nonverbal children were given a structured way to participate and to show their understanding within lessons, such as through labelling shapes, answering questions in literacy and expressing their opinions. Staff were also made to rethink some of their lesson plans, as occasionally pupils used their new-found communication techniques to tell us, ‘I don’t like it, it’s boring’! 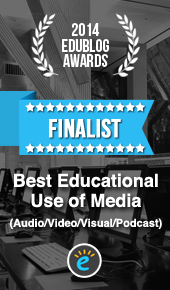 For more information on our experiences of using PODD within an ASD school, have a look at my ‘lightning talk’ on the subject, https://therapyideas.org/live/oct-2013, or for more general information visit one of the links below: http://www.novita.org.au/Content.aspx?p=683 http://www.mayer-johnson.com/podd/ The ‘CHAT-Now’ manual on use of Aided Language at home or in the classroom is available from : https://www.scopevic.org.au/index.php/yiiCart/frontend/product/product/path/1_2/id/2 For booking PODD training workshops with the US, visit www.lburkhart.com. 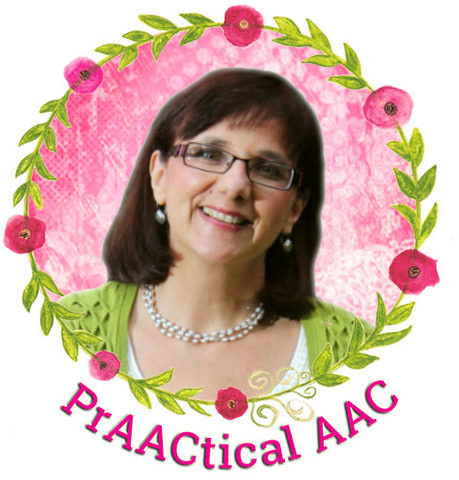 Awesome post – thanks Laura and PrAACtical AAC. Just happened to see this! I’ve seen either work- we tended to use a group book when the teacher was talking to the whole class (and they didnt necessarily have to respond), but one book in a 1:1 situation. Hey, I’m reading this a bit late so hopefully somebody with some ideas will read this! How do you manage using PODD books with very active, mobile children? Like you we have experimented with using the books with children with ASD but the challenge schools face is keeping such a large book near enough to the most active children to be able to reach for it when they are engaging in an activity. By the time they cross the room for it, the moment has passed. Just FYI to anyone watching this late and getting an error message on the video URL – just take out the comma at the end and it’ll work. Great lightning talk and information on PODD in the population of students who have ASD. Great Article! and Great Work! How do you start encouraging a nine year old pupil with ASD and ADHD (whose parents do not want to allow him medication) to use PODD sheets for school activities, homes, sessions etc. The pupil was born in Uganda, apparently went to school there but moved from school to school, came to England five years ago but never been to school in England. The pupil has English as a second language (but parents do not speak it at home), never been in an English school, is completely non verbal and does not understand English language, has no concept of numbers, letters or symbols or what they represent? I’ve tried to use a PODD sheets, single symbols too since September but with no avail at all – he just doesn’t see the symbols as having any meaning. I would like to sign up for some training on this. Do you offer trainings? Janet, I don’t do that but Linda Burkhart and several other fine professionals do. Here is a link to the PODD training calendar in the US: https://sites.google.com/site/testbkeller20/ . Hope that helps.